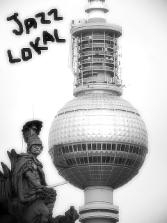 "Jazzy Berlin" community and the new local Israeli web radio "Tachles Berlin" is starting a new Podcast. Our main goal is to expose new audiences to Berlin's Jazz scene and local creators. We are inviting you all to send us your music and events in order to take a part in the journey. We will be glad to get from you music files with biographic details, a band page and upcoming shows. The Podcast Topic is Jazz, however we are not sticking to the cold term and will like to have variety of Jazz sub -genres, World music and even Groove music. Copyrights are taking care by our audio host "Mixcloud".